On the 31st of March 2014 the National Geographic Channel responded to the crescendo of vitriol from the International archaeological community and abruptly canceled the broadcast of the controversial television series “Nazi War Diggers” pending a review. However, the indefinite postponement of the series has not stopped the archaeological community asking serious questions about what many see as a grotesquely misconceived and crassly promoted series. In particular, while the issue has been somewhat overshadowed by promotional video and images showing the inappropriate excavation of human remains in Latvia by personnel who were clearly incompetent to undertake that sensitive task, major questions have also been asked about how the series portrayed the discovery of weapons and particularly how it portrayed the discovery of the kind of unexploded munitions which are inevitable if uncontrolled digging and metal detecting is undertaken on the kind of highly contaminated 20th century battlefield sites the series investigated. At the root of this latest controversy are questions as to the level to which the on screen team, crew and bystanders were put at risk by the apparent failure of the production company, ClearStory Productions, to employ properly qualified and experienced personnel and to observe the kind of basic safety and best practice that digging in the heavily contaminated battlefields in Latvia and Poland requires and which is well documented and understood in the world of conflict archaeology. Research undertaken by thePipeLine using multiple sources has revealed that on at least one occasion during the filming in Poland and Latvia in 2013, potentially highly dangerous unexploded munitions were excavated by the “Nazi War Diggers” team. ThePipeLine also understands that even when the presence of such munitions was recognised the crew continued filming in spite of the danger. It is also reported that this clear risk to the presenters and crew was made worse when requests were made to move unexploded munitions to facilitate camera shots of the material being discovered. The most basic safety practice demands that suspected munitions should never even be touched except by professional Explosive Ordnance Disposal [EOD] operators. Certainly one of the on screen presenters, posting on Facebook as “Addicted to Bleeps” and understood to be Mr Kris Rogers, posted the following entry on 21 November 2013. “I’m now a TV presenter! The post also included a link to a video on You Tube which was subsequently removed, as was a reference to “digging up dead bodies”. A Latvian national involved in the shoot, Mr Dainis Dilba, also posted a picture of munitions on Facebook on the same day as he also posted a picture of members of the Nazi War Diggers production team, thus suggesting at the very least that the programme was being made in an environment where the finding and handling of munitions by amateurs was routine. It is known that no-one on the “Nazi War Diggers” team or production crew was legally qualified to handle unexploded munitions. Therefore any depictions of the team handling such munitions must be taken as condoning such behavior, particularly as the concept of the programme was clearly predicated on four amateurs deliberately setting out to search for and find modern weapons and other battlefield artifacts with metal detectors. Thus, given that the audience for the series would almost certainly have included metal detectorists and others who would be tempted to visit such sites in the UK and abroad, it is suspected that even the issuing of a “Don’t try this at home” type of disclaimer by the producers, a ploy which is common in this kind of sensationalist, object driven, reality television, would not wash in this case, effectively making the series impossible to broadcast. 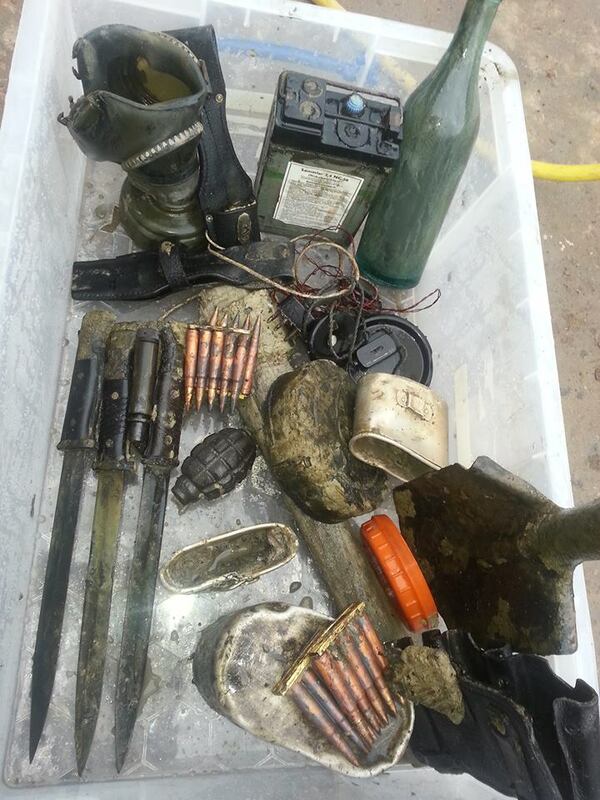 It must be stressed that handling seventy year old stick grenades, shells and mines, is not a theoretical risk. A serving EOD operator consulted by thePipeline confirms that, unlike wine, explosives do not improve with age. Instead they deteriorate, becoming more unstable and potentially dangerous so that even the most professional EOD operators can still be caught out. In June 2010 three members of a German EOD team were killed in the town of Gottingen, while trying to defuse a 500kg bomb from World War Two. A further six people were injured. While this year alone one person was killed in January when a WW2 bomb exploded at Euskirchen in Germany and two workers died and another was critically injured in the explosion of a World War One munition at Ypres in Belgium. Adding to the potential dangers which were faced by the ClearStory team and crew is the fact that by 1944/1945, the period when the fighting in the Kurland Peninsula and Poland which was one of the main focuses of the series occurred, the pressure of work and shortages of materials meant that quality control in both German and Soviet arms factories was not all that it might be. In those circumstances the chance of a weapon failing, or a fuse becoming faulty increased substantially. That is just one more reason why all legitimate conflict archaeology projects, such as the Plug Street Project in Belgium, and the Durand Group working on the Western Front in France and Belgium, have professional EOD cover on site and work closely with local EOD units, or at the very least have clear risk assessments and guidance in place. Rule One of such safety rules is to call local EOD the moment a munition is even suspected and then retreat at least 100m while cordoning the site to prevent anyone else getting closer. By condoning, let alone inciting their team to behave in this way as allegedly occurred on location, ClearStory and the National Geographic Channel may have also opened themselves up to serious legal risks. Hypothetically, facilitating a group of amateur metal detectorists to deliberately set out to find weapons and military material, in an area where there is a very high risk of finding unexploded munitions, compounded by the failure to ensure that the TV crew and its team of amateur presenters had professional EOD cover, might be construed as a breach a company’s duty of care under the UK Health and Safety at Work Act. By consenting to undertake, or participate in such activity, for example by acting as a director, camera operator or sound recordist, any freelance member of a production team might also be in breach of the Act because freelances too owe a duty of care to others whose health and safety might be affected by their actions. Given that it is known that more than one person explicitly warned ClearStory Productions about the need to address these safety issues before the production commenced filming in Latvia, Poland and the UK during 2013, observers in the Conflict Archaeology community also suggest it might also be interesting to ask the company’s insurance company if ClearStory’s insurance policy would have remained valid in the circumstances described, had there been an accident, or worse a fatality, involving munitions?